Merry Christmas everyone. See you in 2010! It’s a space you can get together with like-minded individuals and work on your urban gardening, crochet, hacking, programming, media arts, filmmaking, animating project without worrying that you’re in a library, coffee shop, pub or other unsuitable venue. We know hackers and craftspeople need work space and may need to get down and dirty – we also know sometimes you need a quiet area to present and show works to your peers. We support both activities. And we hope there will be a rich mix of individuals who’ll get out of the usual zones, the knitter talking to the software architect, the cupcake maker scheming with the laser etching builder. We know some good will come of this. I think some good things are definitely going to come out of the Mad Lab. Also, a lot of robots. It's available for meetings, meet-ups, and dastardly plotting of all kinds, so keep it in mind. 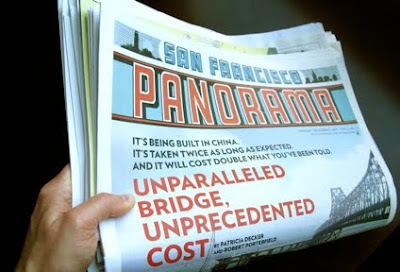 In other unconventional newspaper news, McSweeney's only went and published their latest edition of the literary mag as a broadsheet, The San Francisco Panorama, that people could buy from Bay Area newstands (which sold out in about ten minutes flat. You can order it from McSweeney's in the states, but I can't seem to find anywhere selling McSweeney's no. 33 in the UK. You listening, Santa?) In addition to championing a beleagured format the paper features 16 colour pages of comics from the likes of Chris Ware, Dan Clowes and Art Spiegelman. If we could get the broadsheets in this country to publish 16 colour pages of comics regularly the UK would be a better place. Or even four pages. But a few months back The Guardian axed the wonderful comic they were publishing on Saturdays. Boo. To read more about the Panorama head over to Flavorpill's Flavorwire where there's an interview with Oscar Villalon, McSweeney’s publisher, originally sent out in their excellent weekly book email, Boldtype. Pictures via Tonx, who has a good post about it too. 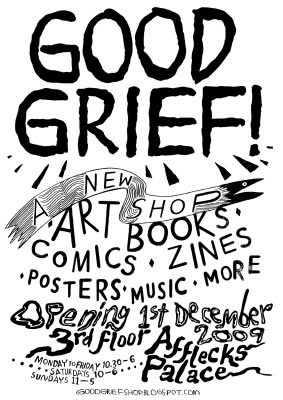 Yes, new shop Good Grief! brings a bulging sack full of art book, zine and comic goodness to a hut on the third floor of Affleck's Palace. Also music, and posters, and music posters. I am very excited about this. We could really use more places in town to buy this kind of stuff. At the moment there seems to be an amazing bounty of illustrators and comics in Manchester doing weird and wonderful work that it can be absurdly tricky to get ahold of. Keep up with the Good Grief! gang on their amusing blog here. Thanks for the tip Kate Taylor.